A British mother facing six months in jail in Dubai after being convicted of adultery insists she is innocent. 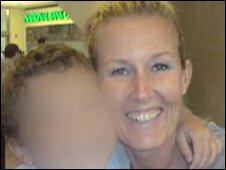 Marnie Pearce, 39, says she was framed by her ex-husband so he could gain custody of their children, aged four and seven. He denies the claim. The teaching assistant has appealed against her conviction but fears she may never see her children again. She called on the British government to intervene and extradite her children back to her family in the UK. "I want them [the British embassy] to get my children out now. They are British citizens, my family can take them for me... this is going to be a matter of a few weeks," she told the BBC. "I'm handing over their guardianship to my family. They are still in my custody, I have the right to nominate someone to take my children." Miss Pearce, who is staying with a friend, has been banned from leaving the Arab state while she is on bail pending her appeal. If it fails, she is likely to be deported and may lose custody rights to her sons. She said: "They can't take custody of my children, they are babies... if they lose their mother now they will be psychologically damaged for the rest of their lives. This is not fair. "I love this country, it's been my life. I've raised my children as Muslim and always supported and respected my husband... my life is here, I don't want to leave, I'm being forced to leave." Ms Pearce, who met her Egyptian ex-husband Ihab El-Labban 16 years ago, said their marriage broke down three years ago but she remained in the marital home. She alleged he then began a vendetta to win custody of their sons by falsely accusing her of having an affair. Mr El-Labban has denied the claim. He told the Mail on Sunday: "We had problems for quite a while and we tried to live with things but I decided to take a break for the kids. She then had an affair." But Miss Pearce claims he stormed into their home in March with police while she was having a cup of tea with a friend and wrongly accused them of having an affair. "My friend was having a cup of tea on the balcony outside... he stood there in horror while my husband was screaming at him," she said. "We went to the police station and gave statements and were allowed to leave at midnight." Miss Pearce, originally from Bracknell in Berkshire, said she was ordered to give a DNA sample and that her passport was taken away. She also said her husband took possession of the family home, forcing her and her sons to move into a dirty shelter for nine months. "We've been living in poverty, squalor and filth and I've had to beg for clothes... they kept turning the water off, so we went to the mosque to shower," she said. Her brother, Daniel Pearce, 36, said: "I don't think the system over there is fair because they haven't given my sister a chance to fight her own corner." He said he was also angry over what he claimed was the British government's failure to help. "They could have got her passport back and the kids passports back, but they weren't interested," he said. Miss Pearce's appeal has been backed by Conservative MP for Bracknell, Andrew MacKay, who has raised the case with the Foreign Office (FO). An FO spokesman said: "I can confirm British national Marnie Pearce is involved in an on ongoing court case in Dubai. We are providing consular assistance."